A coach and mentor who has spent countless hours developing youth through baseball and softball, including co-founding a special program that supports those sports. Two high school soccer players who developed a program to help under-served girls enjoy the sport of soccer. A dedicated volunteer who has spent decades developing youth through soccer. A coach and athletic director who has helped expand youth sports opportunities. These are the honorees that will be recognized at the annual Bob Emig Foundation Celebrating Leaders in Youth Sports event to be held Thursday, October 6, 2016 at the Missouri Athletic Club in Downtown St. Louis. Tickets for the event are $100 per person or $1,000 for a table of 10, and include a reception and dinner. Tickets and sponsorship opportunities are available through Camille at the Bob Emig Foundation (618) 343- 2898 or camille@emigfoundation.org. The master of ceremonies will be Joe Wiley, former St. Louis University basketball star and sports analyst, who was named one of the 100 athletes who shaped St. Louis sports. KidSmart – Tools for Learning which provides schools, where 70% or more of the students are on the Free/Reduced Lunch Program, the necessary tools (pencils, crayons, glue, etc.) to achieve educational success. There are 90,000 students in the St. Louis metropolitan area in need of these supplies and our Foundation believes in a well-rounded student including health and wellness. Studies have shown that students that are physically active on a daily basis have better grades, are more focused and are less susceptible to diabetes, obesity and depression. Our Foundation will increase the KidSmart services by creating a playground and sports equipment division and help the overall program reach schools in Southwestern Illinois. The Jackie Joyner-Kersee Center as it develops its soccer program. It was Bob’s vision to create a quality soccer program in East St. Louis. 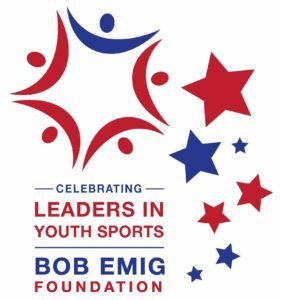 The leaders in youth sports being honored demonstrate the principles that the Bob Emig Foundation encourages, especially “going beyond the game” to be a role model for youth on and off the field. The Todd Bruns Athlete Award honorees are sisters Abigail and Ellie Crabtree, Edwardsville High School soccer players who started the Sisterhood of Soccer organization to mentor and educate girls about the sport of soccer. The Cathy Hill Volunteer Award honoree is John Suess, who has devoted decades to supporting youth through the sport of soccer. The Jim Emig Coach Award honoree is Pete Hoffman, a longtime area baseball and softball coach and co-founder of the Collinsville Extreme Baseball and Softball Club. The Bob Emig Award for supporter of youth sports honoree is Rick Keefe, a long-time coach and athletic director who was responsible for expanding sports programs at Waterloo High School. The awards are named in memory of people who shared Emig’s love of youth sports and the ideals he believed in. They were a fellow coach and brother (Jim Emig), an athlete that Emig coached in youth soccer and admired throughout his athletic career (Todd Bruns), and a family friend and volunteer (Cathy Hill) who demonstrated the importance of volunteerism to youth sports. The Bob Emig Award goes to a dedicated supporter of youth sports. Emig was a sports reporter for the Metro-East Journal from 1966 until it closed in 1979. During his career, he was also a freelance reporter for the St. Louis Post-Dispatch, KMOX Radio and the Suburban Journal newspapers. Emig served as the editor for the Redbird Review newspaper in the early ’80s. From 1994-2001, Emig was the Director of Competition for the Prairie State Games, Illinois’ largest amateur sports festival. In 2001, he was named to the Illinois High School Basketball Association Hall of Fame for his media contributions throughout the years. Emig was also a Lifetime Honorary member of the Baseball Writers’ Association of America. Emig coached youth baseball, basketball, and soccer, including the Goalbusters, which became one of the Metro-East’s most successful select boys’ teams. He also coached freshman and JV at Althoff Catholic High School, Belleville, IL. He originated and ran the Annual Tournament of Champions’ soccer tournament from 1987 to 2000, raising thousands of dollars for youth teams. He served as Athletic Director at SS. Peter and Paul Catholic School, Collinsville, IL, and at St. John Neumann Catholic School, Maryville, IL. In all of these endeavors, Emig focused not just on skill development, but also on mentoring youth through the experience of the sport. He believed that anything could be accomplished through focus, giving your best and a positive attitude. To learn more visit EmigFoundation.org.